You are here: Home / Training / Why study with us? When you choose to study with EPIC Education Assist, we’ll work hard to ensure you achieve your goals. We’re flexible, committed to your success, and will support you every step of the way. We explain everything clearly, and ensure you understand what theory and practical work you will be completing. Our team will help you understand what to expect from your course, and what is expected of you. We take care of your paperwork and administration, so you can focus your energy on what matters. 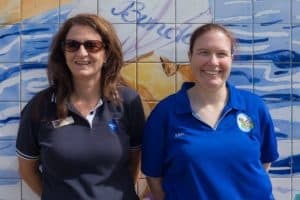 EPIC’s Lisa Simpson catches up with Erin at Bundy Swimming Academy. Our team will check on your progress regularly and help you if you’re having problems with anything. We are committed to helping you finish your qualification and reach your goals. EPIC’s courses and workshops are delivered in a flexible way, so you can learn at your own pace and in a way that suits you. Our courses can be studied online, in a classroom, or a mix of both. The practical workshops are interactive and encourage group participation, which increases learning outcomes. We use our decades of experience in disability services and our passion for education to ensure you have the support and resources to achieve your goals. Transitioning from school to employment can be challenging. EPIC delivers the national Ticket to Work (TTW) program, which creates employment pathways for school students. EPIC Schools Consultants visit participating schools, and help students complete modules that will help them get job-ready. TTW helps build students’ confidence as they prepare for working life. At EPIC we believe our workforce should reflect the diversity of society, and that’s why one in six EPIC employees has a disability. We draw upon the disability experience of our staff to tailor our teaching to meet each individual’s needs. Our trainers have extensive experience and a proven track-record of giving our students the individual support they need to complete their qualification. Our trainers are educated and enthusiastic people who know how to keep you motivated and engaged. Find out how we have supported Alex to realise his potential.